A tangle of politics and problems may force yet another delay in long-sought updates to the broke, beleaguered U.S. National Flood Insurance Program (NFIP). Congress has the unenviable task of putting NFIP back in the black without raising rates too quickly on folks who can’t afford to leave vulnerable coastal homes. And the weather isn’t helping. The NFIP was due for reauthorization in September, after several years of challenge in the wake of the enormously costly Hurricane/Superstorm Sandy in 2012. Then came Hurricanes Harvey, Irma, and Maria this year—which complicated matters further by adding another $10-plus billion to the program’s $25-billion debt. Congress passed a temporary extension of the NFIP that runs out in early December. There’s now a good chance that another extension will be needed, perhaps into 2018. The 21st Century Flood Reform Act, a House bill that appeared this week to be nearing a vote, instead found itself bottled up in committee. Several other draft bills in the House and Senate this year have failed to gain traction. The NFIP was launched in 1968, at a time when private insurers were abandoning the flood market. The program was intended as a way for the federal government to pick up the slack while reducing long-term flood risk. Communities that join the NFIP are required to maintain minimum floodplain standards in order for their residents to access NFIP insurance. The program has mushroomed from a few thousand policies in the 1960s to about 5 million today, providing more than $1.2 trillion in coverage. Maximum coverage for a single-family home is $100,000 in contents and $250,000 for the structure itself. Figure 1. 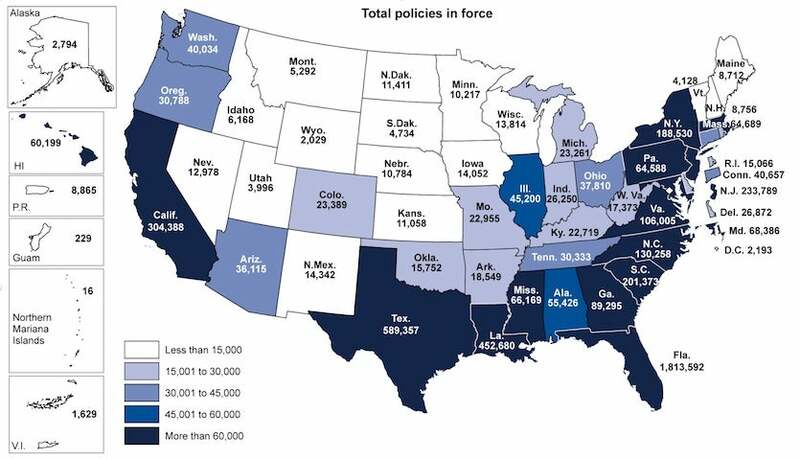 Number of NFIP policies in force as of March 2016. Image credit: “Review of FEMA Study and Report on Community-Based Options,” U.S. Government Accounting Office, August 2016. In an ideal world, NFIP premiums would be calibrated to the actual flood risk at every location. In fact, the payouts are more than covered by premiums in most years. However, “NFIP’s overall rate-setting structure was not designed to be actuarially sound in the aggregate, nor was it intended to generate sufficient funds to fully cover all losses,” noted the U.S. Government Accountability Office in a 2017 report. Moreover, NFIP’s founders may not have fully anticipated the headlong rush to develop in flood-prone areas, especially near the Gulf and Atlantic coasts, and the resulting explosion in the value of coastline property. As noted in a YaleEnvironment360 report, the value of land and structures along the New Jersey coast rocketed from less than $1 billion in 1960 to more than $170 billion by 2017. Catastrophe modeler Air Worldwide estimates that the insured value of property in all counties along the U.S. Gulf and Atlantic coast jumped from $7.2 trillion in 2004 to $10.6 trillion in 2012—and that’s taking into account the big hit to home values in the late 2000s caused by the Great Recession. Increased development can itself boost flood risk, as rainfall flows readily off pavement and into swollen waterways instead of being absorbed by the landscape. Then there’s the impact of intensified heavy-rain events and rising sea levels, both of which are research-confirmed products of a climate being warmed by human-produced greenhouse gases. The 8 inches of Sandy-related storm surge attributed to rising sea levels since 1900 in the New York area may have been responsible for as much as 24% of Sandy’s property damage in New York City ($2 billion of $8 billion), according to a study from Climate Central and the University of North Carolina. Most of the biggest hits to NFIP have come from hurricanes and mid-latitude winter storms. These can produce both surge-related inundation on the coast and rainfall-related flooding well inland. Still other events, such as the Midwest’s Great Flood of 1993, have racked up hundreds of millions in NFIP payouts many hundreds of miles from the coast. In recent years, the U.S. has seen several multi-billion-dollar flood events hitting thousands of people who live outside NFIP’s Special Flood Hazard Areas—regions designated as having a 1% or greater flood risk each year. Flood insurance is required in order to get a home loan in these “100-year-flood” areas. The timing of updates to these maps varies from place to place; some maps have not been updated since the 1980s, which can leave the current risk underappreciated. Insurance Journal reported an estimate from catastrophe modeler RMS that Louisiana’s “no-name” floods—the costliest U.S. weather disaster of 2016—hit tens of thousands of homes in parishes where as few as 1% of property owners carried flood insurance. Only about 15% of homes in the Houston area had NFIP policies when Hurricane Harvey struck, according to Steve Bowen, director of meteorology for insurance broker Aon Benfield. At the other end of the risk spectrum, where flooding is routine rather than unexpected, we have “severe repetitive-loss-properties,” the highest category of multiple flood losses. According to a 2017 NRDC report, these properties flood every two to three years on average; they represent nearly 10% of all NFIP payouts (1978-2015) but only 0.6% of insured properties. More than half of these homes are valued at less than $250,000. FEMA grants are available for buying out such properties, but it’s up to state and local governments to pursue such grants or to pay for buyouts themselves—and often this doesn’t happen. What are the possible fixes? A gradual ramp-up in rates for higher-risk areas. The NFIP was last renewed through the Biggert-Waters Flood Insurance Reform Act of 2012, passed in late 2011 when NFIP was more than $17 billion in debt. Crafted with bipartisan sponsorship, Biggert-Waters mandated that NFIP’s premiums should be in line with the actual risk and potential losses at each location. As a result, many premiums that had been held artificially low for years suddenly jumped by as much as a factor of 10. The rate hikes were quickly reined in by the Homeowner Flood Insurance Affordability Act of 2013, which limited the annual increase in premiums for single-family homes to a maximum of 15% (or 25% for those with severe repetitive loss). The new House bill would allow a continuation of this more gradual type of increase, though the exact numbers may end up being tweaked. The House bill also adds a minimum $5000 deductible for damage incurred at severe or extreme repetitive-loss properties. A greater role for private insurers. Free-market-oriented legislators would like to see more emphasis on the private sector in addressing NFIP’s woes. The House bill would establish a federal clearinghouse by 2021 that would steer customers toward private insurance options in high-risk areas. For properties where no private coverage is available, NFIP would serve as the insurer of last resort. One risk with such an arrangement is that it could make it possible for private insurers to skim off the lower-risk policies, leaving NFIP with the tab for higher-risk properties. New assistance for low-income policyholders. The House bill would establish a Flood Insurance Affordability Program, allowing and encouraging states to help residents that are in financial need obtain NFIP insurance. It’s not clear how states would pay for such programs, though. There is no changing climate problem for the program. Hurricanes per NOAA data from 1851 are no stronger or more than the past. Actual damage from weather per the insurance industry was down for 5 years running last year. Federal flood insurance was and is a pork barrel designed to gain votes for the politians not be run as a business. it has been under funded for years as the politicians do not want to raise rates to cover the actual losses. Since the rates are already high most people pass on getting the insurance which simply makes things worse. It is like Obama care, if everybody actually bought the insurance the rates could be lower but they are so high a large number of lower and middle class families simply pass paying the penalty as that is lower cost by a lot than the insurance. There is private insurance so it is not like there is no protection, you simply have to pay. The actual problem is building a whole lot of homes in flood plains and building them to not be wind resistant like the newer Florida codes. That is the politians buying votes at the expense of the future. Where is your data. your response since you have none is call people names which does not do anything constructive. Houston stories even admit they built in flood plains as did Miami , New Orleans and in Puerto Rico. Hurricanes are a fact of life, you have to build to mitigate that damage which means large parts of some cities should not have been built on.